Most employees go through the E-Verify process easily, without incident or any issue that arises. However, there are some problems that can occur. If E-Verify has any issue in confirming the eligibility of an immigrant or nonimmigrant to work, it may return a "tentative nonconfirmation." If you and the employee act promptly, a tentative nonconfirmation may be little more than an annoyance. However, failure to take action could lead to the employee not being allowed to work for you. If you are a Gulf Coast employer have issues with tentative confirmations, whether they are related to the Department of Homeland Security or the Social Security Administration, a dedicated Houston immigration lawyer can help you address and overcome these problems. Kathryn Karam is a dedicated attorney for Houston-area employers facing issues like tentative nonconfirmations. She is able to address these sometimes-complicated issues with creativity. Her goal is to find the solution to your issue. Call Karam Immigration Law today at (832) 582-0620 to set up a consultation to discuss any TNCs your business is experiencing. Karam Immigration Law serves clients throughout the Greater Houston area, including Greenway Plaza, the Energy Corridor, Katy, Clear Lake, The Woodlands and Tomball. Many employers in Houston use E-Verify to determine the legal status of an employee they seek to hire. E-Verify is an internet-based system run by the U.S. Citizenship and Immigration Services. It checks the potential employee's data against millions of government documents to determine whether the employee may legally work in the United States. In some cases, the verification process does not find matching data, and will return a result of "tentative nonconfirmation" (TNC). A TNC does not mean the employee is ineligible. However, it does mean that action must be taken. An employment-based immigration attorney can help you identify the problem and solve it. A tentative nonconfirmation is generally rooted in one of two sources: With the Social Security Administration or with the Department of Homeland Security. E-Verify runs the employee's information through Social Security records. If the Social Security records do not match, the Social Security Administration (SSA) returns a tentative nonconfirmation. The cause may be that the employee did not update his or her immigration status with the SSA or the fact that he or she because a citizen. It could also be that the SSA has incorrect records. As the employer, you should notify the employee of the TNC. He or she may know what the problem is, and decide not to contest, at which the TNC is considered final. The case must be closed with E-Verify, and you must notify them whether you terminated the employee. If the employee contests the case, however, then you must refer the matter to the Social Security Administration. Your attorney can work with them to determine the problem and correct it. Once you notify the government that the case is contested, it must be resolved with eight working days. A tentative nonconfirmation can also occur when E-Verify runs records through the Department of Homeland Security. DHS might return a TNC if the I-94 number, A-number, foreign passport number or any other document is incorrect in their records, if any information for U.S. documents cannot be verified or there is any other type of discrepancy is found in DHS records. The process is similar to an SSA TNC: You notify the employee, who should tell you whether or not he or she contests the matter. A lawyer can help you work the situation out. A tentative nonconfirmation should be nothing more than an inconvenience if you are a Houston employer using E-Verify. However, if not quickly resolved, it can mean that you lose the talent you were seeking to recruit. 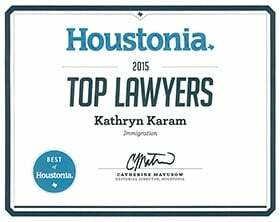 Houston immigration lawyer Kathryn Karam can help you with TNCs. Call today at (832) 582-0620 to set up a confidential consultation.